A few months after performing to a soggy crowd at the Thunder Bay Blues Festival, Mingo Fishtrap returned to Thunder Bay for an encore performance. 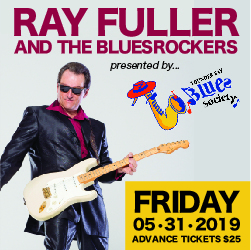 Given the frosty temperatures on November 23, it’s safe to say they aren’t impressed with Thunder Bay’s weather, but frontman Roger Blevins Jr. did indicate he was impressed with the resolve of the fans that stuck it out at Bluesfest. The show started off “slow like Ike & Tina” in the words of Blevins. But, the slow pace didn’t last long as the band ripped into their signature pop/soul/funk that brought a crowd out to the dancefloor that multiplied as the night wore on. Mingo Fishtrap played original material, peppered with songs by the likes of Otis Redding, Billy Preston and, of course, James Brown (while medleys can be corny, their melding of the Godfather’s hits was punchy and fun). McGillivray’s Landing at Fort William Historical Park made for a relaxed venue for the show that was presented by the Thunder Bay Blues Society and Fort William Historical Park in support of the United Way of Thunder Bay.